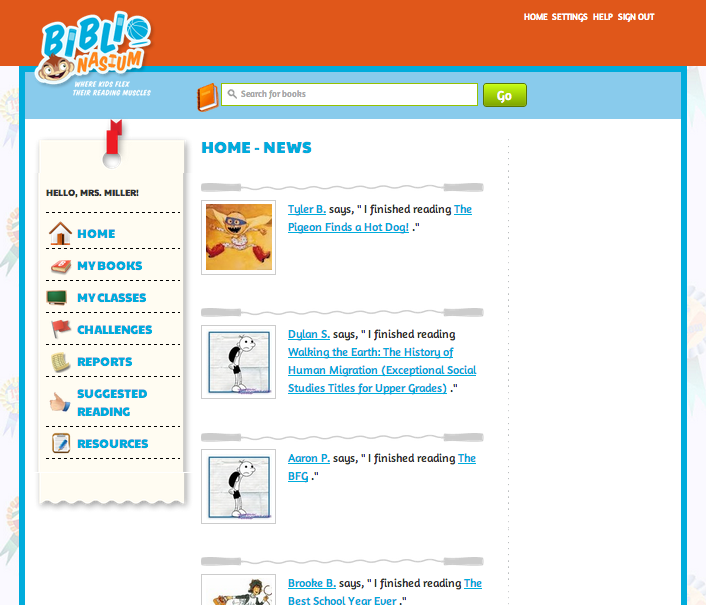 The Library Voice: BiblioNasium....An Awesome NEW "Virtual Reading Village" The Third Graders LOVE! I just love it when I see a tweet or Facebook post for a new website or resource that I haven't heard of yet. 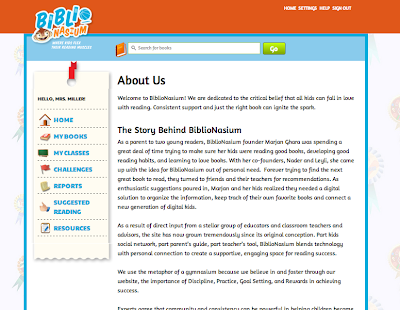 This week I saw a tweet about a website called BiblioNasium. 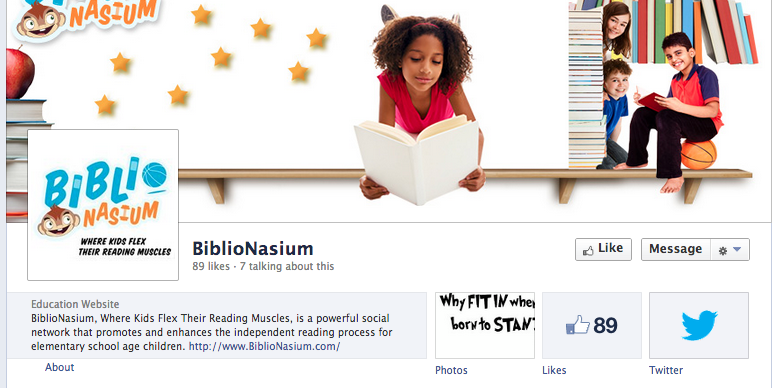 The name was so intriguing and when I read "Where Kids Flex Their Reading Muscles"....I really wanted to check it out! "Founder Margan Ghara and her kids realized they needed a digital solution to organize the information, keep track of their own favorite books, and connect a new generation of digital kids. 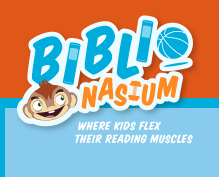 Part kids social network, part parent's guide, part teacher's tool, BiblioNasium blends technology with personal connection to create a supportive, engaging space for reading success." I couldn't wait to tell the teachers and parents about this site! I emailed several of them right away. And I especially couldn't wait to show the students. I wanted to try it out right away, so I decided to use it with the 3rd graders that I would had this afternoon. I went to the two teachers, Ann Volk and Jenny Stephens, and asked them for their students Guided Reading Levels and told them about the website. They were excited too. I created two classes, one for Mrs. Volk and one for Miss Stephens. I then put their students into each of their classes. You only need to put in the name and BiblioNasium will do the rest, but I choose to type on the username and password for each one. I also added the Guided Reading level for each students as well. There is a spot for parents email and the teachers are getting me those too. It is easy to add and edit once the student profiles are created. When the 3rd graders came in for library and technology time, I showed them BiblioNasium and explained to them that it would be our very own "virtual reading" space. We have talked about social networks during our digital citizenship lessons since the beginning of the year, but this gave us a chance to have another conversation about being online with others in these types of networks. On BiblioNasium, there are three places to sign in.....Kids, Parents, and Teachers. The kids all signed in with their new usernames and passwords that I gave them. They then set their profiles up by picking their avatar from a list and a background for their page. There are other things that can be set, such as town and birthday, but we didn't do that today. 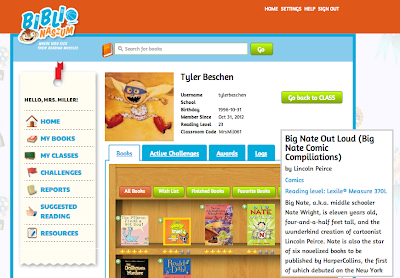 On BiblioNasium, students can search for books by title of author to play on their shelves. 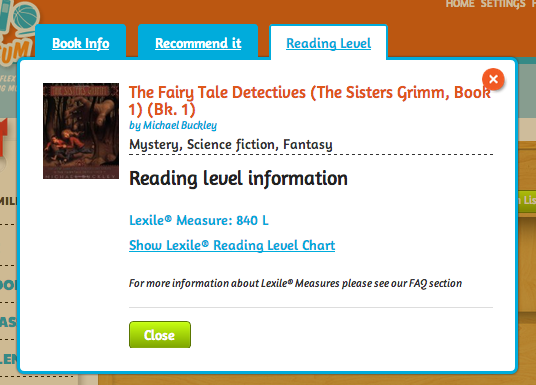 They can even search by category or Lexile Reading Level. 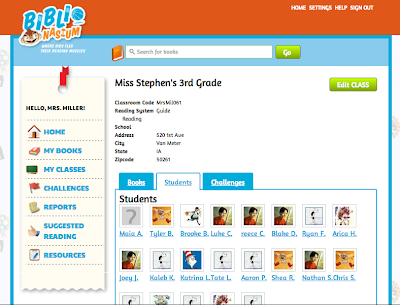 Once books are on their shelf, students can look at All Books, Favorites, Recommended (which others can recommend if you are "Friends" within BiblioNasium or within a classroom), Required (which a Teacher sets up within their classroom/teacher account), and Classroom Wish List (which goes along with the class that the students are in). 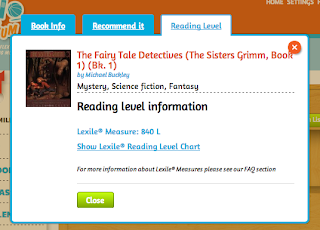 get the "Reading Level Information" for each specific title, which helps students find books that "Fit Just Right." 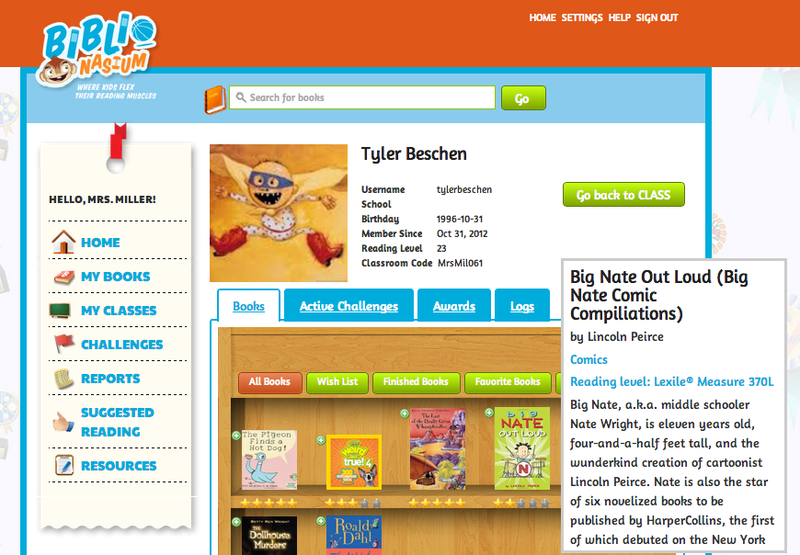 Once the students in your class have added books to their shelf, they will show up under your "Home-News". You can see the actions that they have taken, including adding new books, giving reviews, adding friends, and more. 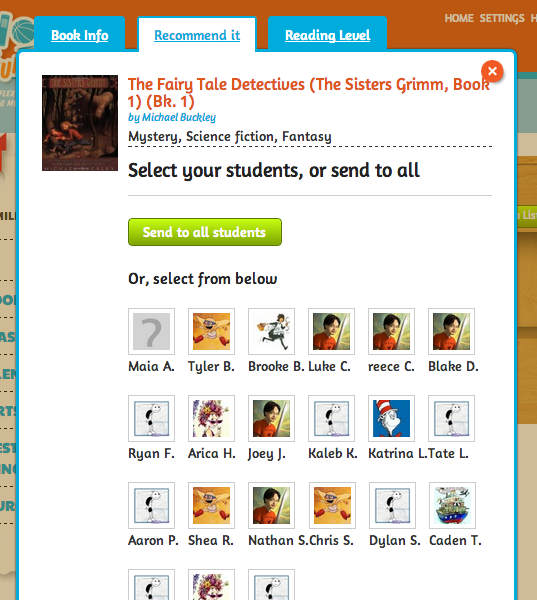 Then you can go to your student's BiblioNasium to see which books they have added to their shelves. When you click on one of the books, a little summary of the book will come up. 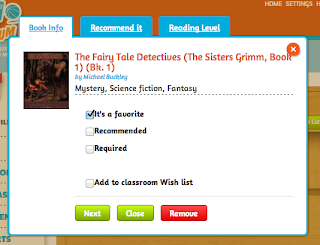 One can also "Add To My Classroom" by choosing a book cover from the shelf and then clicking "Add" to my classroom". It will give you an option as above too...."Book Info", "Recommend" and "Reading Level." 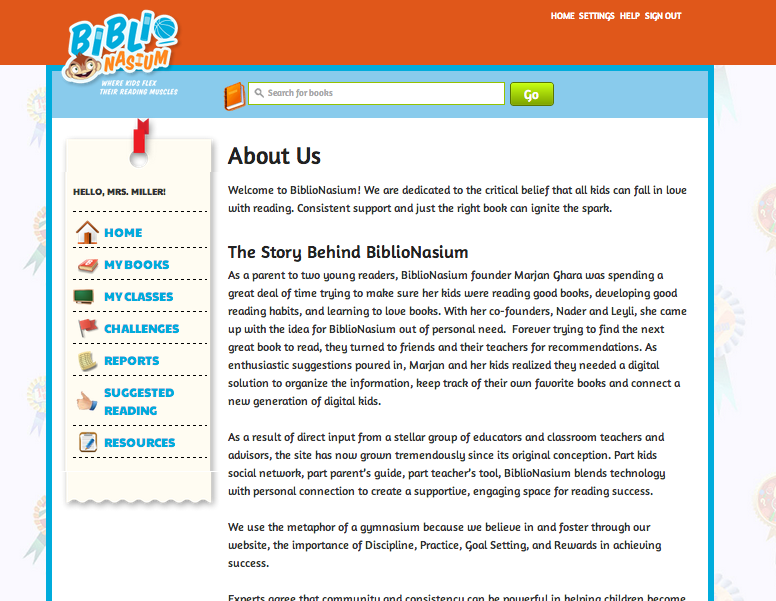 So today, this is how far we got in BiblioNasium and it was an awesome experience for the 3rd graders. There is a lot left to write about from this website, such as setting up "Challenges" for your classes and students, accessing "Reports", and checking out the other "Resources." I am going to dive into BiblioNasium over the weekend and next few weeks with my 3rd graders. I want to really get them going within the website and learn the "in's and out's" with this grade level before I introduce it to the entire staff. There is so much more this website can do to support literacy and I am excited to learn how! For now you can find them on Facebook at BiblioNasium and on Twitter at @BiblioNasium. Thanks for posting this. I shared this post with one of my fifth grade teachers and we have set up her classes and will begin on Monday. I can't wait to hear how your third graders do. Kicking Off Banned Books Week At Van Meter!